Beautiful, functional, and enduring laminated butcher blocks. Experience the elegance, sophistication, and warmth of real wood. Natural wood and its wide array of choices is sure to enhance your decor whether it be English traditional, Scandinavian contemporary, Country French or American farmhouse. Wood Welded, these beautiful Eastern Hard Maple counter sections are ideally suited for kitchen countertops, workplace countertops, kitchen islands, counters, wood countertops, kitchen carts, wood cutting boards, dining tables, dining table tops, carving boards, bakery tables, workbench tops, and special counter applications. Maple is considered the best wood to use because of its tight grain and because it doesn't splinter easily. 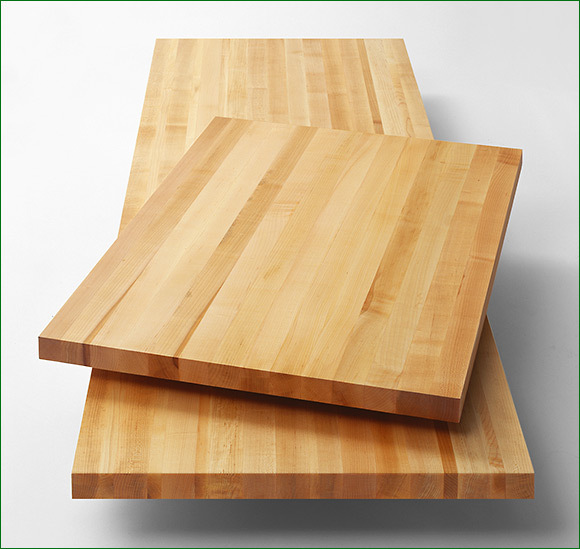 High quality hardwood maple counter sections are available in many popular sizes. 18", 24", 36", 48", 60", 72", 96", and 120" by 1-1/2" thick and 25" deep. All of our counter sections are specially laminated and sealed for long-term service. For custom sizes and larger quantities please call us toll free at 1-877-723-0209. We offer commercial and contractor discounts.